Incumbent Brian Bowman and challenger Jenny Motkaluk made pledges about taxation and sewage outflows over the noon hour on Friday as the rhetoric intensified between the two mayoral candidates. Standing alongside the Red River at The Forks, Motkaluk pledged to reduce overflows from combined sewers — those which carry both land drainage and wastewater — into Winnipeg's waterways by spending up to $1.5 million to install backup power at lift stations. Those stations, which push the mixture of surface runoff and residential sewage to city wastewater treatment plants, can fail during rainstorms. Backup power at these stations could reduce the annual number of outflows from combined sewers into Winnipeg's rivers by one-third, Motkaluk said. Motkaluk also accused Mayor Brian Bowman of not moving quickly enough to replace combined sewers in central Winnipeg with dedicated pipes for both sewage and stormwater runoff. The province has given Winnipeg decades to undertake this task, which could cost up to $4 billion. The City of Winnipeg spends between $24 million and $28 million a year replacing combined sewers. Motkaluk would not say how much more money she would devote to combined sewer replacements if elected mayor, but pledged to work with Ottawa and Manitoba to help the city pay for the job. "One of the ways is to have positive working relationships with our senior levels of government and Brian Bowman has failed on that throughout the course of his tenure," she said. Since the city was ordered to improve wastewater treatment in 2003, Winnipeg has borne most of the cost of upgrading sewage treatment plants and replacing combined sewers on its own. Minutes after Motkaluk spoke to reporters, Bowman stood in the lobby of his Notre Dame Avenue campaign headquarters and pledged to limit annual property tax increases to 2.33 per cent for the next four years. That amounts to no change in the status quo, as the pool of taxes collected from existing city properties has risen by 2.33 per cent during each of the past four years. The incumbent mayor, however, gave himself some wiggle room: his property tax pledge is based on the assumption the province won't reduce its funding for the city. 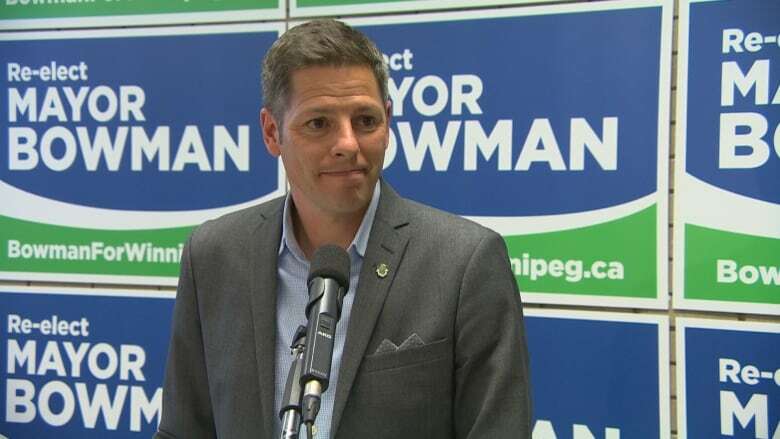 "We can't envision if there will be real cuts to their support and … we need to be transparent and honest with Winnipeggers [that] it's a risk," Bowman said. "It certainly is not something we can plan for right now." Bowman also pledged not to increase water and sewer dividends or raise frontage levies during his next term. The two candidates also took shots at each other. Motkaluk began her press conference by welcoming Bowman to the race and noting the absence of prominent businesspeople at the incumbent's campaign launch on Thursday night. "In 2018, the incumbent mayor of the City of Winnipeg could not even fill a small room at the Winnipeg Convention Centre," she said. Bowman said Motkaluk's comments are unbecoming of someone who wishes to become mayor. "I think it will remind a lot of Winnipeggers about what we saw at city hall in the previous term. I don't think we should go back to that sort of negativity and that sort of toxicity in politics." A total of 10 candidates are registered to run for mayor on Oct. 24. To appear on the ballot, candidates must submit valid nomination papers by Tuesday afternoon.